I have been thinking a lot about gender lately and it brings to mind one of the most beautiful humans I have ever met, Maya Vivas. Maya opened my eyes to the presence of Cis-privilege, they were gentle and kind with me in my naivety. I am generally sweet, kind and open hearted, but I am naive. We exhibited Maya’s work three times at the ANX Gallery. 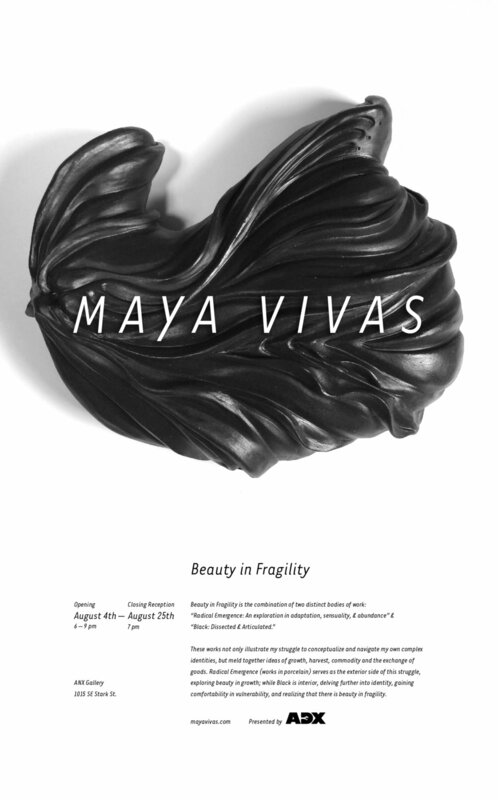 Below is the poster from their solo exhibition, Beauty in Fragility. With the good intentions, we hosted an all women’s makers exhibition, Fabrique, and invited Maya to exhibit. I, a privileged cis-gendered white woman, made the assumption that Maya identified as a woman. They gently corrected me upon the gallery opening though was glad to have been a part of the show because it had created a safe space. However, I was confused, why would they not tell me from the beginning upon making my mistake when I invited them to show? Well, there are so many reasons, and I won’t begin to explain them to you as it is not my place. I was determined to correct my mistake and returned with an offer of a solo exhibition. They blew me away with their grace and accepted. It was an incredible experience. In another attempt to show my love for Maya and the good work that they do, I made a few custom signs for Ori. A gallery that Maya and Leila Haile opened, focusing on featuring work by queer folk of color. Click here for more. About 6 months later I had the honor of exhibiting Maya’s work again in one of my favorite shows, a group exhibition by the 2018 Prequel Program - "i'm glad i came" - which also included Ali Balter, Winnie Black, Marcelo Fontana, Emily Wise, Kevin Holden, Alan Page, Pace Taylor. It was a pleasure to be able to present Maya's work, they are incredibly hard working, kind and open about their art. I am incredibly humbled and grateful for the opportunity to work with Maya and all of the amazing artists I had the honor of working with while curating at the ANX Gallery. Thank you Maya, for your patience and kindness, and for bringing beauty into our world every day. If you know me then you know that over the past few years I have been consumed by my work, working for small locally owned businesses in Portland, OR, all with less than 15 employees. 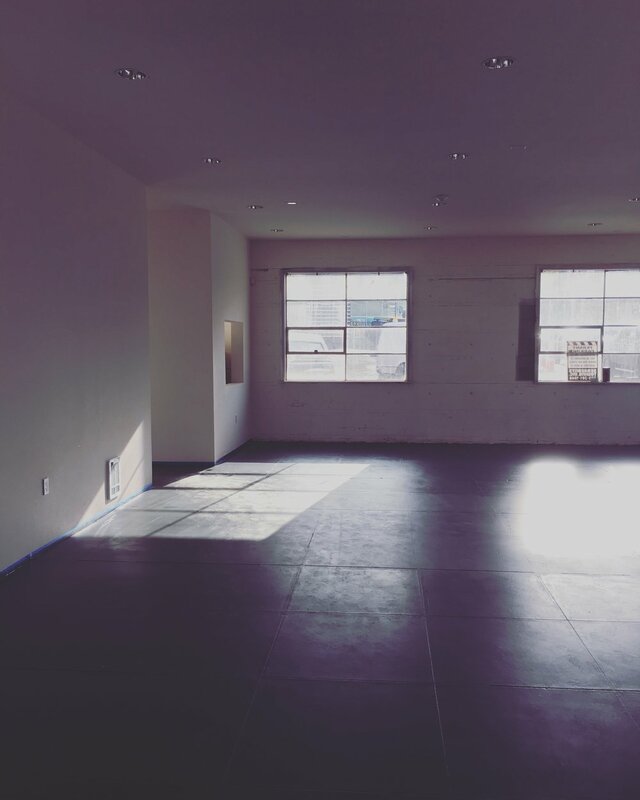 A ceramic tile company, a cement casting art studio and a Makerspace Fabrication Shop. It has been an incredible adventure so far in the world of making. When you work at a small company you have the opportunity to wear many hats and to gain some incredible experiences. I have allowed my job to be a huge part of my identity, I am trying to adjust this to being more in line with passion as purpose. I am a maker. When someone asks me what specific process or material I use I am always surprised by this question, that is the best thing about being a maker! The materials and processes are limitless, I can work with metal, wood, cement, light, sound, computers, paper, ink. The main point is to figure out what your passion is, it can have many paths and tendrils (like my obsession with various processes and mediums), and commit. There are people less qualified than you, doing the things you want to do, simply because they decided to believe in themselves. "It does not do well to dwell on dreams, and forget to live." A.D. It fosters a positive environment. It is related to my field. I want to be moving forward and keep growing! I think we all need this in every aspect of our lives, to continue to learn processes and grow in our relationships with friends, co-workers, family and ourselves. I commit 110% and I spend most of my waking life at work, I need it to be a place I want be to each day. Optimism is a huge part of my identity, when I am surrounded by negativity I lose my sense of purpose. We have the right to a positive and supportive work environment because we deserve joy! "Employees give their valuable energy and time to the company. If they are not given the opportunity to serve the company by working effectively, there can be no joy. For the company to deny that opportunity is to be against the principle of respect for humanity. Am I making things? Yes. Cool! What is your field or passion? Is your dream to run a coffee shop? Then find a job as a barista. It is essential to understand every part of the business from the bottom up. Too often I see folks who start companies and are so high up they can't see where the actual work gets done. It is a lean concept, that when you remove yourself from a position or a process that you aren't performing every day then you are no longer the expert. Trust your team and employees, learn from them! This is a new one, I'm terrible at making time for myself, self care or my studio practice. This year's theme is balance. "Some days are for eating salad and doing yoga, other days are for eating cupcakes and refusing to put on pants, it's called balance." It has been quite a while since I've completed a body of work. I finally did it in January! It didn't come out quite as well as I wanted because I wasn't able to give it the time it deserved. The show was titled "Ever the Optimist" and ironically, during install I did not feel super optimistic or proud of how it came out. Once I was at the opening my friends and peers convinced me that I'd done well and that this was a step in the right direction. I could take pride in the fact that I had made something, I learned from it. I had worked several hours of overtime at my job in the weeks before, but I'd made it! It's all about making mistakes and learning from them. Or in lean, to learn how to react and be nimble in the face of reality so that when problems arise we can be ready to dodge and adjust as we need to. If you find yourself stuck, seek out someone in that world or community. There are mentors everywhere, go to events, say hello and ask questions. Visit places that are doing things similar to what you want to do and observe. Take notes on their processes, presentation and target demographic. Pay attention to businesses outside of your field, often times the best processes are borrowed from other fields. I hope that these guidelines help you plan a path to where you want to be. Go live it up and go make something! Wow. We made an artist residency! It is amazing how connections and collaborations happen, during unexpected moments. I was on a tour with the ADX Fabrication Team checking out the incredible FORM studio and shop. We were blown away by their machines and talented team of sculptors, designers, and technicians. The 3D printers they use are designed for air and space technology, they use them for art! The 3D scanning technology is used to take an object so that they can create multiples, manipulate the details and scale. This is a place artists dream of, this is a place I would dream of. We have been wanting to create an AIR program at ADX for a while but we have fallen short in certain resources, this was a chance to collaborate and create an incredible opportunity for a talented eager artist. Together we have made a residency we all wish we could attend! Perhaps that's the trick, to create opportunities that others wouldn't have otherwise and the platform to tell their story. It is an amazing honor to be a part of this project and to have the chance to work alongside FORM and with their incredible team. I am thrilled to welcome Lisa Radon to the FORM + ADX Air pilot. During the AIR launch last week I was enthralled by her presentation where she touched on her approach to process, materials and concept. She spoke about her home, otherworldy inspirations, mine craft, sci-fi, our current political state of affairs and how she uses her work to rise and resist. Radon is a great fit for this pilot program and can help guide us through this experience as well, I have so much to learn! Viewport, 2017. white oak, 9’ x 9’ x 1/2″. Console, 2017. King Starboard marine plywood, bubble thermal insulation material, Project-O-Stand, selenite. 17” x 14” x 1-1/2”. Photo courtesy: Et al. Gallery. ADX Portland and Form are pleased to announce Lisa Radon, visual artist, writer and performance artist as the recipient of the 2018 FORM+ADX Artist-in-Residence (AiR.) Radon will receive resources, technology, and materials to explore new ideas, processes, and perspectives. This includes a 3-month workspace at Form with access to 3D digital process and printing, a 3-month ADX membership to work with various materials and equipment, and 1-month solo exhibition at ANX Gallery, which is housed at ADX. FORM+ADX AiR was established through a partnership between Form and ADX. Form was founded on the idea that the newest advances in 3D technology could energize and elevate artists in new and exciting directions. ADX is a hub for collaboration where individuals and organizations make and learn. By sharing tools, knowledge, and experience, ADX believes in doing things better by working together. As such, this program is a first of its kind. Lisa Radon has made exhibitions at the Portland Institute for Contemporary Art, Pied-à-terre San Francisco; Ditch Projects, Springfield, OR; Artspeak, Vancouver, B.C; and was included in Six Weeks at the Henry Art Gallery, Seattle. Her books include The Blind Remembrance of the Swirling Bone, Infinity Increaser, The Plumb and The Wave, and Prototyping Eutopias. In 2016, she was in a two-woman exhibition at RONGWRONG, Amsterdam, and created a solo exhibition at Jupiter Woods, London. In 2017, Radon launched Atrium of the Sun, The World Wide Web/Disjecta and will present How Like Water for Panel/LA in Los Angeles, CA this coming year. Radon publishes the journal EIGHTS. Opening Reception: Feb 2nd, 6-9pm. Exhibition Open: Feb 2nd – 25th. Ink + Press is an exhibition featuring works in the print medium including screen printing, letterpress, bookbinding, intaglio, lithography and other various types of printmaking. This was an awesome show to host, with over 30 artists. This is the kind of show that makes me feel really lucky, since the gallery is attached to my office/woodshop I have the pleasure of spending time with the art in the gallery every day. I am grateful to ADX for allowing me to have this show as well as to host and curate shows at the ANX Gallery. We have put on shows since last March and are coming up on a year! We are currently scheduled through June and have some awesome exhibitions coming up. I want to thank my amazing gallery team, Emily Wobb, Jenna Lechner and Ray Naglar. Three badass babes who made this whole thing possible, I couldn't do it without them. I'd also like to acknowledge the one and only Kristen Crouch, my studio spirit animal, and the artist who helped me with the beautiful archival prints. As well as the incredible Richelle Thorpe who upholstered the glitch chair. I was so nervous about the artist talk but thanks to my genius and extremely talented friend, Lindsey Snell, it went extremely well. Instead of having a presentation format she suggested a discussion panel as an alternative. Emily Wobb and Lindsey Snell hosted and made the artist talk far more enjoyable and bearable for everyone. Thank you to Ellie Fisher of the Heebie Jeebie Babes Podcast for editing the sound on my artist talk which will be posted soon! And of course, my family. During my artist talk I was asked where I get my optimism. I have to say it is from my folks, I have the absolute best parents in the world who have always encouraged me in my passions and pursuits. My sister, Sabrina Rose Woolhiser who is also an artist, is my other half. She understands me unlike anyone ever will. All of my family has always helped me on my path, buying paintings and ordering commissions from me since 1999. Thank you aunties and uncles, your support means the world to me. Thank you to my Portland people who come to my gallery openings and listen to my woes and tales of the life of an artist. You are a trooper and a true friend. And lastly, thank you to the professors, teachers and mentors I have had the honor of working with. I still have so much to learn from you. This show is about my how I've tried to navigate personal experiences as well as the changes that have been happening on a local and international scale. 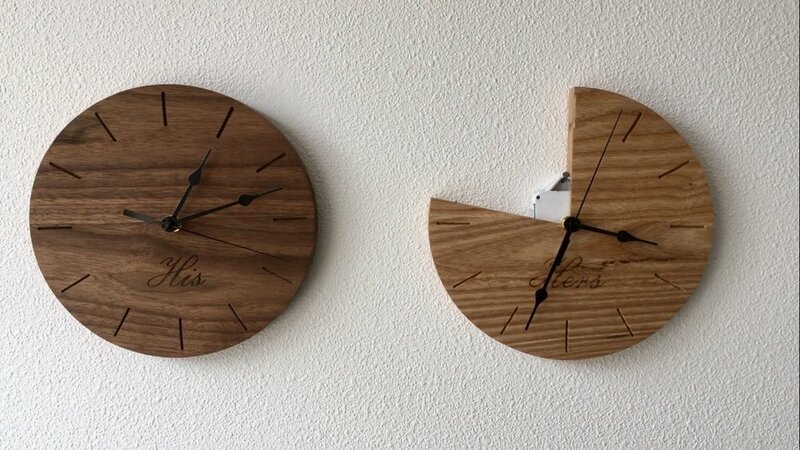 I made prints, blankets, paintings, a chair, clocks and sculptures. It was a weird show and it was a good way for me to get back into the studio, to try and balance that with work and the gallery. Initially I felt disappointed with how it turned out, ironically I was not optimistic about the opening. This made it even more difficult to show up and smile and talk about my work, but that is really what helped remind me that why I made the work in the first place. Just show up and keep making. “Ever the Optimist is an exhibition of works that draw on my experiences and surroundings. I combine aerial landscapes and domestic objects through sculpture, photography, and installation to illustrate our connections with everything and everyone around us, as well as what they have to teach us. New Work: "Lies I've Been Told: 'You Should Be Happy'"
"For too long, women have not been heard or believed if they dare speak the truth to the power of those men. But their time is up. Their time is up." I am so grateful for the incredible pioneers of civil and equal rights for people of color, the LBGTQ community and for women. I am strong, but I can only dare to dream that I can be half as strong as any of these incredible activists. If I can channel even a fraction of their courage and honesty it will be worth it. That is why I am making these artworks and telling these stories, believe me, they hurt to tell. He made a decision that would affect our lives and informed me of it rather than pursing this decision together. I was told, "You should be happy when a good decision is made for you." That my opinion, didn't matter. That I should accept a decision that was made for me without complaint or protest. That I should not be allowed to make these decisions that will affect my life forever. I said "No." And I left. Why a blanket? Good question. I have always had a strong love and connection with blankets as comfort objects. This is my attempt to reclaim the power of those words, to gain strength from them and to transform them into something for myself. I have been afraid to talk about these moments or to share these stories for fear of shame. The time is up for fear of speaking up is over. Me too. Emily Wobb is one of the most inspiring emerging artists I have the honor of knowing and working with. She has a way of finding creative solutions for her ideas to make them a reality as well as a perseverance to reach across expectations and connects communities through her processes. Wobb illustrates concepts of suburbia and privilege in her processes of building, destruction, and rebuilding. It takes courage to destroy a sculpture, to rip it apart and then to somehow make it into something new. She does this with things and objects as well as stereotypes and social constructs, she doesn't accept the way our society allows us to say, "oh, that's just the way it is." 22 Floors is an incredible show that is a continuation of the Good Night series that spans over the past three years. I find her replica of the yard building particularly compelling. The Yard is an apartment building on the waterfront in Portland, OR, just a few miles away from the ANX Gallery. Wobb critiques our construct of suburbia by creating McMansion replicas, destroying them in a performance where she dragged them around with a rented Escalade and then refabricated them into a sculpture of the yard building. The company building the Yard building ran out of money during construction and instead of having the reflective mirrored windows it is covered in dark black windows and looms at the Willamette's edge, though I do admit it has grown on me since the exhibition of this show. This sculpture also reminds me of a story from an Art History class back in undergrad. There was an art critic in Paris in the 1890's who hated the Eiffel Tower so much that he would go up in the Eiffel Tower every morning to have breakfast so he wouldn't have to look at it. 22 Floors is a continuation of a 3-year-long series, Good Night, in which Emily Wobb builds replicas of affluent vehicles and dwellings and destroys them in spectacular ways. With the debris, new replicas are built that have the same opulent connotation -- and so the series continues to cycle. In earlier stages, Wobb has done this by pushing wooden BMW X5 models through a wood-chipper and cast the mulch with clear resin into 747 airplanes molds. 22 Floors involves a mulch yard landscape (Mt Scott Fuel Co, 6904 SE Foster Rd), a revving Cadillac Escalade, several Ryan Home “McMansion” house replicas, and a new replica for the next cycle. The final video and installation presented at ANX Gallery and are made possible by the Regional Arts & Culture Council 2017 Project Grant. A cycle of sleeping and waking up. In the Good Night series, I build objects and cycle them through narratives of destruction, change, performance and stages of installations. The project confronts a hostility between instilled dreams from a suburban upbringing (expensive vehicles, affluent lifestyles, privilege, naive privilege, patriotism), self-worth determined by winning, earning, goals, and a dream of being told I'm good. The deaths the sculptures go through are steps in the course of the series--X5 Mulch being the first step followed by 747 Skin and 22 Floors. It was an amazing experience to bring together Women and Non-Binary artists, makers and craftswomen. I was so inspired to be surrounded by such wealth of knowledge and passionate people. Fabriqué took place June 2017 and was an exhibition of works by local Portland makers, artists, ceramicists, and designers. 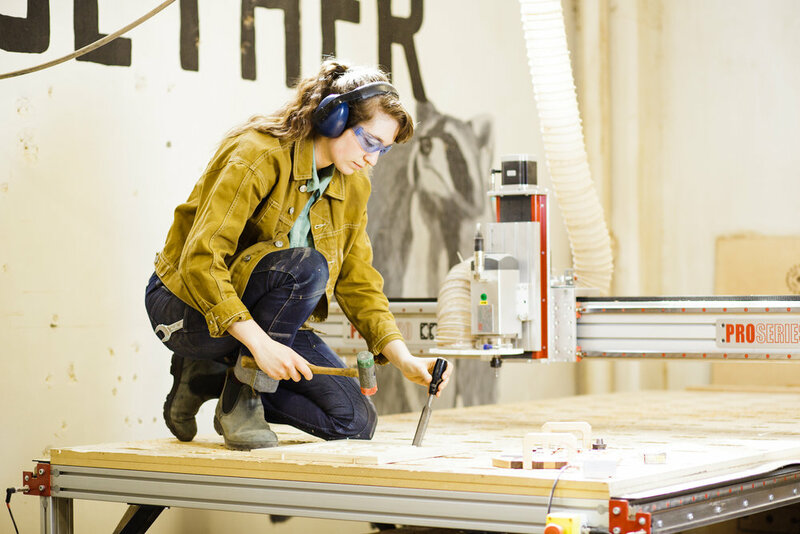 With this platform, ADX sought to shine the spotlight on Women-identifying artists and fabrication professionals who are exhibiting a variety of objects. The spectrum of works in this show included furnishings, kayaks, sculptures, 2D works, and ceramics. Charlie Haughey is a retired carpenter living in Portland, OR, who served in Vietnam with the Army 25th Infantry division. Between 1968 and 1969, he shot nearly 2,000 photographs. After returning home, Charlie boxed up the negatives (of which he had only printed and seen about 10%), where they stayed for over four decades. In 2012, Charlie began working with his friend Kris Regentin to digitize and catalog the negative collection. Please visit our Gallery Site for a little more on Charlie. I have had been given the honor of co-curating the ANX Gallery space with, the one and only, Emily Wobb at Art Design Portland, a local makerspace. Curating has always been a passion of mine, to be able to fill a room with art, to give folks a platform to talk about their work and their point of view, and to bring people together. Thank you ADX for this opportunity. ANX Gallery provides Portland with an exhibition space that shows a variety of media, artworks and functional objects. Alternating monthly member-maker shows, group and solo exhibitions provide a spectrum of form, function and utility. A goal of this curatorial project is to provide exposure to local makers, fine artists, and those who bridge the two. Additionally, we aim to offer people from underrepresented communities — women, people of color, LGBTQ and other minorities — a stage to display their talents and wares.